The German man is charged with complicity in mass murder at a Nazi concentration camp during World War II. 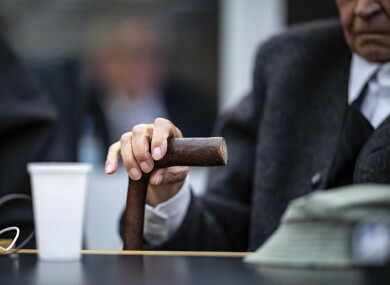 A 94-year-old former SS guard holds his walking stick at the beginning of a trial in Muenster, Germany. A FORMER SS guard aged 94 broke down in tears today on the first day of his trial in Germany charged with complicity in mass murder at a Nazi concentration camp during World War II. He was not publicly named but German media identified him as Johann R, a retired landscape architect and divorced father of three. Dressed in a wool suit, he entered the regional court of Muenster in a wheelchair, with a walking stick in hand, facing charges of being an accessory to the murders of several hundred camp prisoners. Initially composed, the defendant started weeping when the court heard written testimony from Holocaust survivors who now live in the United States or Israel, read out by their lawyers. Marga Griesbach recalled, according to national news agency DPA, how she saw her six-year-old brother for the last time in the camp before he was sent to Auschwitz where he died in the gas chambers. Another survivor and co-plaintiff, a woman from the US state of Indianapolis, charged that the defendant “helped to murder my beloved mother, whom I have missed my entire life”. “Many people were gassed, shot or left to die of hunger,” he added, stressing that the guards “knew about the killing methods”. Each court hearing will likely last for a maximum of two hours due to the defendant’s advanced age – even though, prosecutor Brendel said, “mentally, he is still fit”. If found guilty, he faces a sentence of up to 15 years in prison – even though, given his age and the possibility of an appeal, he is considered unlikely to serve any time behind bars. “Germany owes it to the families and victims to prosecute these Nazi crimes even today,” he said. However, both men, convicted at age 94, died before they could be imprisoned. Historian Peter Schoettler highlighted “an important humanitarian and legal reason” to push on with the justice process, stressing that “the rule of law should not allow for exceptions”. Griesbach, in her testimony, said that “I don’t harbour hatred or rage in my heart”. Email “Former Nazi concentration camp guard (94) breaks down during first day of trial ”. Feedback on “Former Nazi concentration camp guard (94) breaks down during first day of trial ”.